The Annabelle Stool comes in three sizes: counter height, bar height and extra tall height. The featured Annabelle Counter Stool has a seat that sits at the classic 26’’ counter height. It is made to save space during non-use, as there are no armrests to catch on the table. It slides neatly underneath. But, comfort is also given due focus, as the chair features a high supportive backing, a swivel seat that is padded with a plush cushion, and a footrest that wraps most of the way around the base. The backrest is made with wood, and the rest of the frame is made with coated steel. The protective coating prevents the surface from being scratched and damaged with use. The color of finish is up to you. Amisco provides a range of options, and you choose the one that fits best in your space. Match the frame finish with the cushion cover, which is also up for customization. 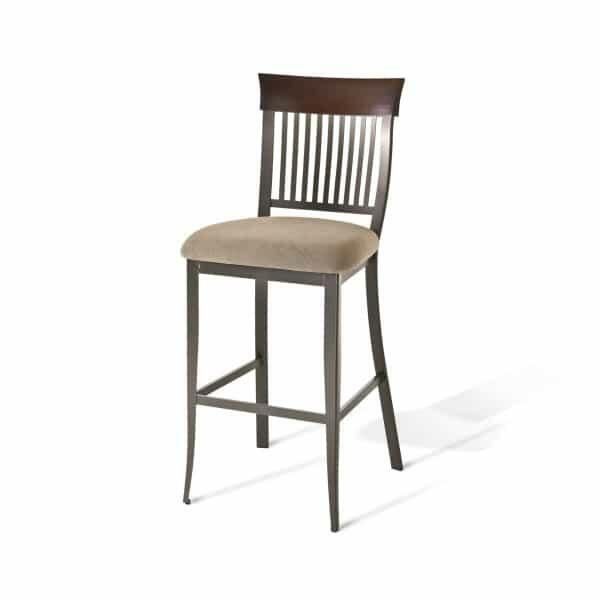 The Annabelle Counter Stool starts you off with an upscale frame design and construction. The rest is up to you.